Work-related stress and job burnout are among the leading causes of poor physical and mental health, with many workers suffering from anxiety, depression, and exhaustion. In recent years, numerous stress management interventions and mindfulness-based workplace programs have come to the rescue, promising less stress. But do these programs work? Two new studies say “yes”. In the first study, a total of 30 executives from a large oil company were offered 16 weeks of mindfulness-based stress reduction (MBSR) training. A growing body of research finds that MBSR leads to a reduction in stress, and improvements in mood, health, self-efficacy, and self-compassion. To test its impact on stress and health in the workplace, researchers collected blood cortisol levels and blood pressure readings, as well as participant’s self-reports of perceived stress, and physical and emotional health before and after the 16-week program. A total of 22 executives (21 male) completed the MBSR training, which included a one-day introductory session, and single-day trainings at the end of weeks 4 and 8. Participants were given audio recordings of daily mindfulness practices and exercises, as well as instructions on coping with stress, and a workbook to support their practice. Some executives set up a daily, 30-minute practice group. At the end of the 16-weeks, participants reported less perceived stress, improved physical and emotional health, enhanced sleep, better health-related habits and behaviors, and more self-compassion. What’s more, they also showed significant declines in blood cortisol levels and systolic and diastolic blood pressure, suggesting that both their minds and bodies were less stressed following the program. The second study looked directly at whether mindfulness meditation might improve job satisfaction, and work-related stress and anxiety. Fifteen faculty and staff from 2 Australian universities were offered a 7-week, modified MBSR program. Weekly 60 to 90- minute mindfulness lessons were offered for the first 4 weeks. These included instructions in sitting meditation, performing a body scan, and how to integrate mindfulness into daily life. They met again in week 7 to revise and refine participant’s skills. Before and after the program participants completed questionnaires to assess mindfulness, anxiety, and job satisfaction. Five members were also selected for interviews 2 weeks after program’s end. After 7 weeks, employees reported increased mindfulness skill including a heightened awareness of the present moment, improved focus, paying attention to physical tension, not acting without thinking, and less preoccupation with the past and future. Similar to the first study, they also noted improvements in sleep quality. Some participants also reported added personal benefits including more healthy and harmonious relationships with family, and the ability to leave work behind at the end of the day. In terms of job satisfaction, overall there were little differences in ratings after the mindfulness program. There was, however, a significant link between feeling calm and relaxed, and greater workplace wellbeing, with those reporting less stress and anxiety also noting higher levels of job satisfaction. Interviews provided additional perspective on the benefits of mindfulness for job stress. Most notable was a newfound ability to calm down, stay present, and regulate thoughts, feelings, emotions, and reactions, even in the midst of stressful events. Some participants also reported added personal benefits including more healthy and harmonious relationships with family, and the ability to leave work behind at the end of the day. 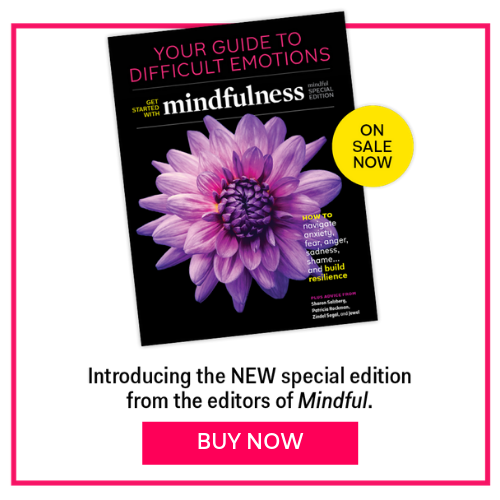 Results of these studies suggest that mindfulness programs in the workplace may help employees better deal with stress, and develop the ability to observe negative emotions and automatic thought patterns and behaviors, and remain calm, present, self-aware and alert, rather than succumbing to the slippery slope of negative emotions. What’s more, findings identify an important link between less stress, and greater job satisfaction. Unlike previous research, these programs were not found to significantly improve anxiety symptoms. This may be due to the fact that mindfulness skills require daily practice, and that their full benefits may only be fully experienced if practiced daily, particularly for those experiencing high levels of distress and emotional burnout.